Hey there! How was your week? Hooraaay! We made it to Friday! 😉 One of my best friends (Elissa – she’s a flight attendant) had some downtime this week in between work trips, so she kept me away from my computer (no complaints, it was a lovely break!) and we had some fun running around town, doing some shopping and of course, eating at a few favorite Austin spots. Today is her last day in town, so while she gets her hair done down the street, I am excited to get this post up while I sit at Starbucks waiting for her to finish! I love having my friends back in town…for the longest time nearly all of my best friends lived in either New York City or Chicago – it’s been so great since a couple have moved back to Austin in the last few months! For those of you with all of your friends in one place, you are very lucky!! The Austin weather has been iffy recently – today it’s gorgeous and sunny, two days ago it was freezing and rainy…as always, it’s terribly unpredictable! 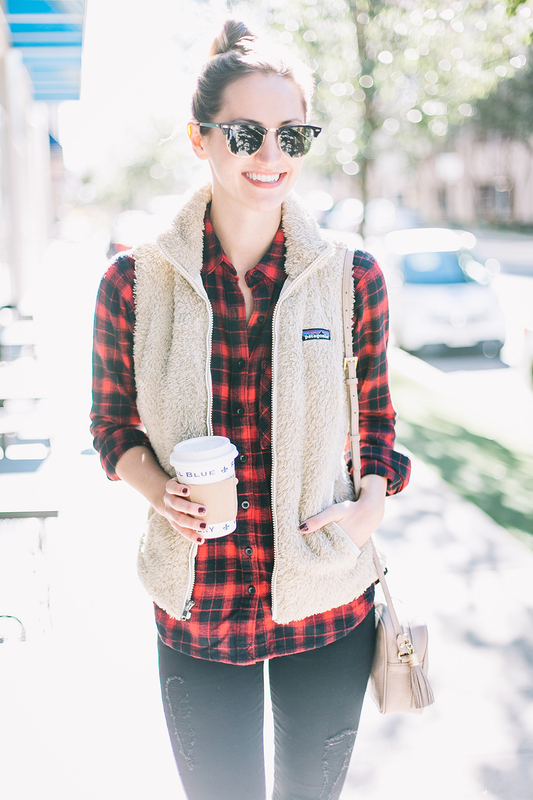 That said, I scooped up this adorable fleece vest last fall and lemme tell ya, it is THE best $99 you will spend all year! 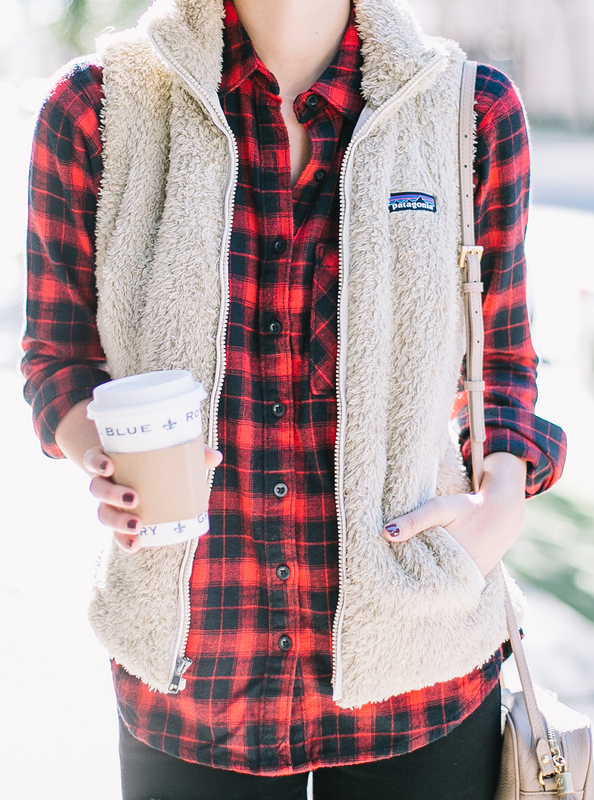 I will forever stand by this adorable vest as both cute, warm and sooo perfect for layering. The color is fabulous, too, and goes with everything! 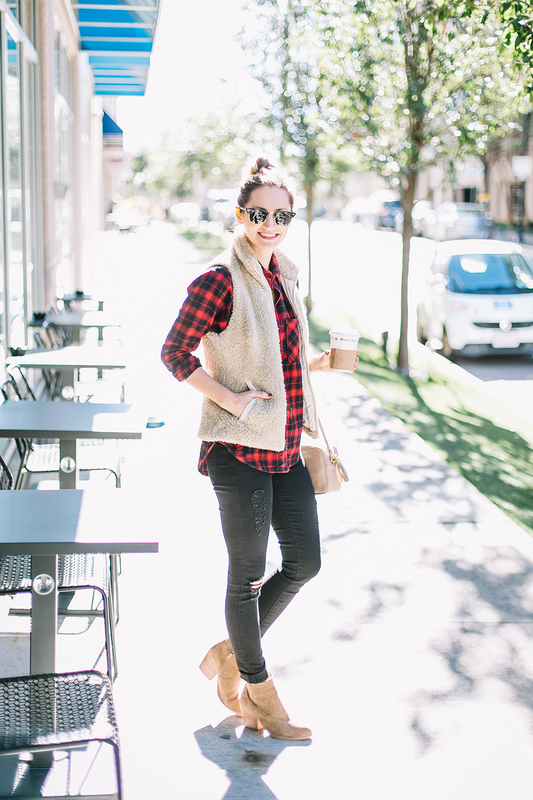 One of my go-to fall/winter uniforms has always (…and will always be…) a plaid flannel button up, comfy denim, a cozy vest and of course, a great pair of ankle booties. 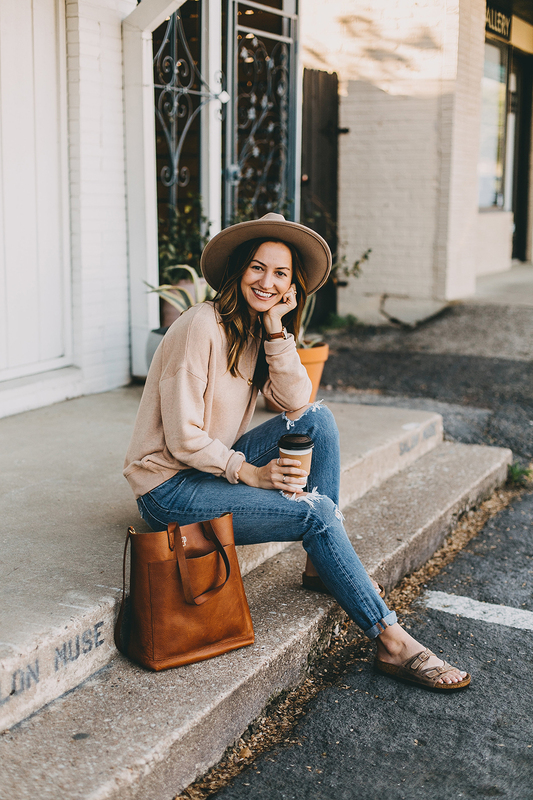 It’s one of those effortlessly casual looks that remains both fashionable and approachable – which is a winning combination in my book! 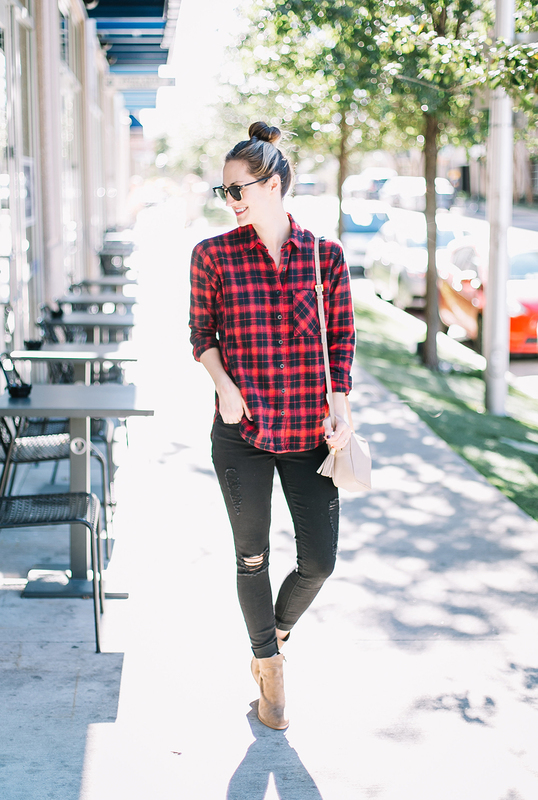 My plaid button up only has a couple sizes left, so I’m linking to a few alternate options that are super similar below. My vest is by Patagonia and this thing sells out SO quick – I am wearing a size small for reference, it runs snug, so order a size up! 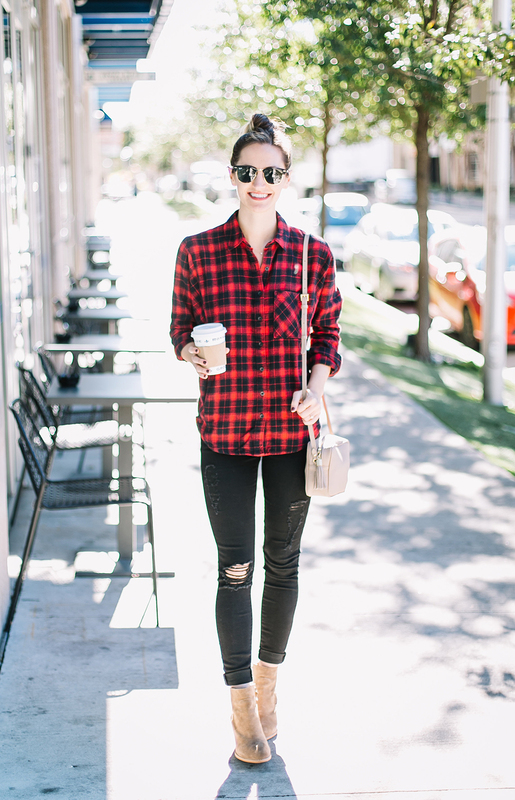 My jeans are Articles of Society and have some stretch to them = a comfortable go-to and under $60! Finally, my booties are Treasure & Bond and yes, they’re the ones I’ve been wearing a TON because this color is the perfect neutral and I love the heel height…not to mention they’re under $100 sooo, that’s reason enough to add ’em to your shopping cart! 😉 Oh! 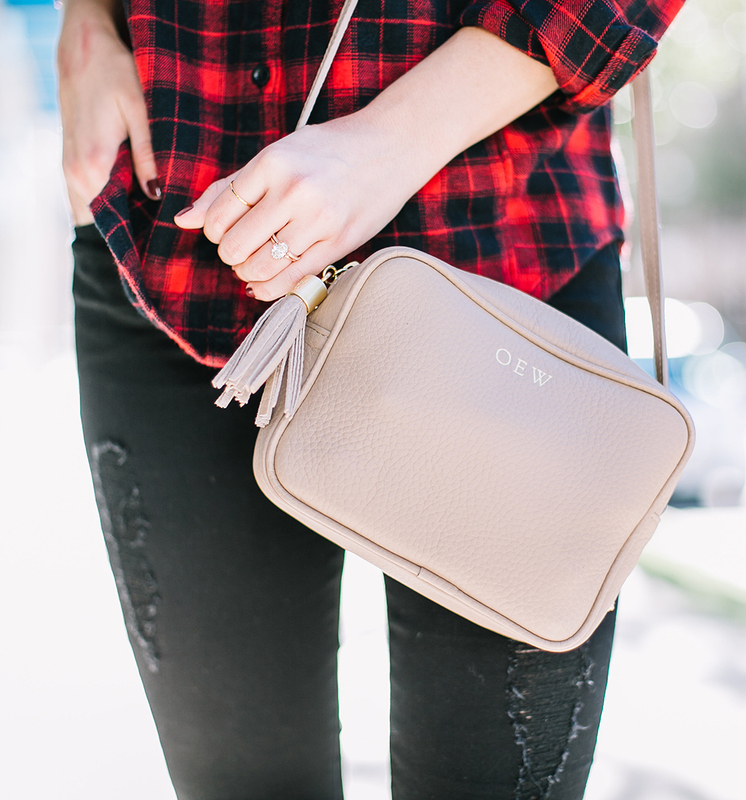 And my handbag is Gigi New York – LOVE the darling monogram option! Now I want this vest. Love it!